When we think of social media and the right strategy to develop, we immediately think of Millennials and Gen Z’ers; and for good reason, too. These two generations grew up on social media and quite frankly, invented it. Their likes and dislikes create the ebb and flow of how businesses market their products to the public via social media channels. Millennials and Gen Z-ers as a whole have been disruptors in the marketing industry and businesses have had no choice but to fall in line. But what about the brands whose products are geared toward the older generations? It’s no secret that older generations are less likely to adapt to technology as quickly as their younger counterparts. Yet the modes of traditional marketing are dwindling. For companies to keep up, they have to adapt, whether or not their clients want to. So, how do brands whose primary objective is to reach the aging population do so in a primarily digital world? Research from marketing agencies in Philadelphia has shown that there are four main social media platforms that older demographics use regularly: Facebook, LinkedIn, Twitter, and Pinterest (in that order). In its ability to be a viable source of marketing for companies wanting to reach out to older demographic, Facebook has far surpassed the competition. In comparison to Instagram, a site Facebook also owns, older target markets frequent Facebook more than any other site. Advertisements seen on Facebook are given a higher weight of credibility than those on other social platforms. Additionally, the older demographic is more inclined to use Facebook as an informational resource rather than a selfie sharing platform. You’re more likely to have your message stick on Facebook than on other social media sites. LinkedIn has become more than just a platform that connects people of similar industries. It has quickly grown to become a trusted source of B2B interactions. Though it is primarily used by professional millennials, there is a solid presence of 40 and up business owners and professionals on the social site. If your goal is to market to older business professionals, then this is the platform for you. However, if it’s a personal product or B2C interactions outside of the job searching capacity, then you’re better off going back to Facebook. To us, it’s a hashtag. To your grandmother, it’s the “telephone number symbol”. Regardless, we have Twitter to thank for it as it is the number one way businesses have been able to engage with their consumers through the social site. Though slow to adopt Twitter, Gen X’ers and Baby Boomers are on the site and looking for content that speaks to them. 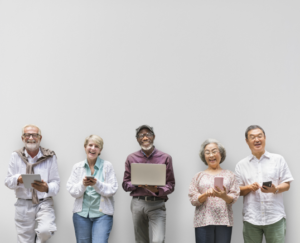 A number of CEOS and marketing agencies have noticed that they have had much success engaging with the older demographic of their buyers through Twitter chats and hashtags. We’re slowly seeing Pinterest level ideas filter onto Facebook, but people still rely on Pinterest for the vast majority of content creation and ideas. For the DIY Mom or the Weekend Warrior Dad, Pinterest has led the way. Older demographics grasp to communities and platforms that make it easier to share. Due to their hesitancy in adopting technology, they look to the younger generations for validation of a social site or their own ideas. Marketers can benefit from this by creating and engaging with those older communities on Pinterest. As with any marketing strategy, it’s important to know your demographic. You have to study how they think, how they talk, and what their interests are. What works for a Millennial will not work on a Baby Boomer. Diversifying your social strategy to reflect your demographic can help your business see success in the long run.